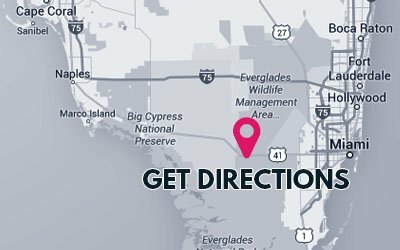 Shark Valley Tram Tours’ location is on the Tamiami Trail, US Highway 41, and the story of the building of the highway is certainly an interesting one. 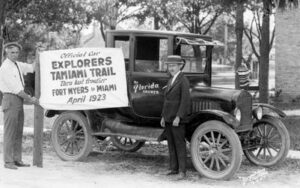 Tamiami combines the names of Tampa and Miami, and in 1923, the Everglades presented a huge obstacle to travel between the 2 cities. Civic and business leaders saw the Everglades as a barrier to economic development, and they formed plans to build a highway through the wilderness, also using it to impede and control what was viewed as an impediment to progress. On April 4, 1923, 24 men set out on a quest to drive across the Everglades from Fort Myers to Miami, and their trip turned into a completely unexpected educational tour of the Everglades. The businessmen’s optimism about making the trip greatly exceeded the capabilities of the cars of the day to drive through the muck and mire. The men found themselves on an ecotour of the Everglades long before the concept of ecotours gained popularity. The adventurous businessmen were supposed to reach Miami by April 6, and when they failed to arrive, local newspapers declared them “Lost”. It wasn’t really that bad, but it was certainly unpleasant. The men eventually arrived in Miami on April 21, and their ordeal generated support for the completion of the highway. Construction took more than 5 years, and today, Highway 41 is still carrying people from the Gulf Coast to Miami. Interstate 75 has made the trip faster, but the modern superhighway certainly can’t match the history or the “Old Florida” charm of the Tamiami Trail, which is now the southernmost 275 miles (of 2000 total) of US 41.